That is a really cute idea! When I run out of Poland pictures someday, I may haunt my cats and capture their exciting lives! The cat on the bottom spends his days in much the same way my dog spends hers. Awww - they're so cute! 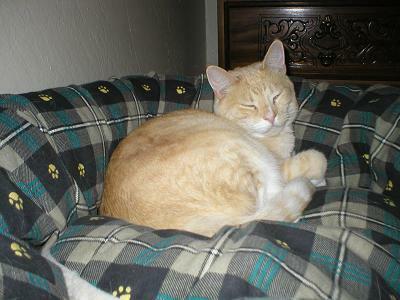 LOL--leave it to the kitty to be jumping up on the furniture and the cat to be curled up safe on in nice fluffy spot. Wednesday is the day I most wish I was a cat. They drag horribly. Love these photos. In my next life I want to come back as someones well-loved house cat. The kitty in the bed looks so comfy! They sure are living the sweet life! Anya looks like she's on high alert and Parker looks really comfortable. Great pics! Hang out with the books, take a nap on a soft cuddly pillow ... what a life. I think I want to be a cat. Parker is actually the jumper in the family whereas Anya isn't too keen on heights. 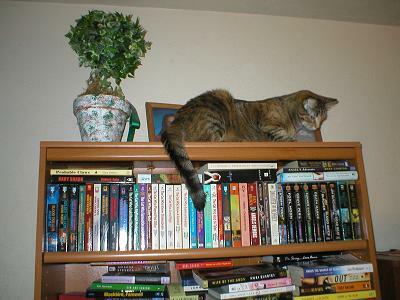 She had a little help getting to one of the lower bookcases, but made her way to the higher one on her own. I loved seeing your cats! I need to take some of mine sometime.